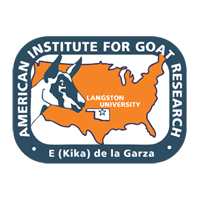 A simple means to estimate feed required for maintenance by Katahdin (K) sheep and Spanish (S) goats (initial BW = 30.6±0.40 and 21.8±0.27 kg, respectively; 8 mo old) by frequent BW measurement and adjustment of feed offered was evaluated. Ten K and S wethers in 1.05 × 0.55 m pens were fed grass hay (64.1% NDF, 10.4% CP, and 55.4% TDN; DM basis), initially at 58 and 55 g/kg BW0.75 (air-dry basis; i.e., ME intake of 427 and 452 kJ/kg BW0.75, respectively), at 0800 h for 5 wk. Three times weekly BW was measured at 1300 h in 50-g increments, and hay fed was varied thereafter by 0-5% (i.e., ≤ 40 g/d) to maintain BW. Breed (732 and 538 g for K and S, respectively; SE=11.5) and wk (625, 653, 632, 623, and 641 g for wk 1, 2, 3, 4, and 5, respectively; SE=9.4) affected daily air-dry intake (ADI; P0.10) were 2-5 and 2-4. Hence, the intercept of wk 2-4 regressions was used to determine feed required for maintenance, with values of 727 and 538 g ADI (SE=11.6), corresponding to a ME requirement for maintenance of 447 and 426 kJ/kg BW0.75 for K and S, respectively. Variability was homogenous between breeds (P=0.867), although intercept SE averaged 6.0 and 12.9 g ADI for K and S, respectively. In conclusion, after 2 wk of adaptation, frequent weighing and change in offered feed for 2 wk may offer a relatively simple means of estimating maintenance feed needs of small ruminants.